Engine: 914 Rotax Turbo, 4 cylinders, 4-stroke, water-cooled, 115 hp with electric starter and mechanical prerotator. Available also with Rotax 912 ULS (100 HP). Empty weight (914): 595 lb. Empty weight (912 ULS): 585 lb. Maximum take-off gross wt - 1212 lb. Useful Load - 617 lb. 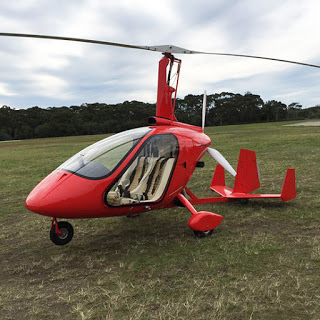 The M16 Tandem Trainer affords many ways to share and enjoy the passion of un-restrained gyroplane freedom in the unprecedented safety and aerodynamic stability the Magni gyros are famous for. Dual-seat share the fun with a companion in comfort and security with exceptional cross-country speed and range. The tandem configuration affords efficient and effective training. 914 Rotax Turbo, 4 cylinders, 4-stroke, water-cooled, 115 hp with electric starter and mechanical prerotator. Empty weight (914): 629 lb. Useful Load - 583 lb. The M-24 Orion is a fully enclosed, side by side two seat, dual control model specially designed for those who do not want to go without comfort when having fun. The external lines of the fuselage perfectly embody the famous Magni Gyro style. The enclosure design, the interior arrangement, and the large windscreen and side windows, offers excellent panoramic field of view. The large side doors provide easy access to the roomy cabin. Large carbon fiber instrument panels provide a dynamic contrast to enhance the perception of the roomy cabin while providing a perfect backdrop for a large variety of available standard and available instruments. Efficient ventilation provides refreshing cabin cooling in the summer and cabin heat in the cooler months. The M-24 Orion is equipped with two baggage compartments. with electric starter and mechanical prerotator. Useful Load - 612 lb. 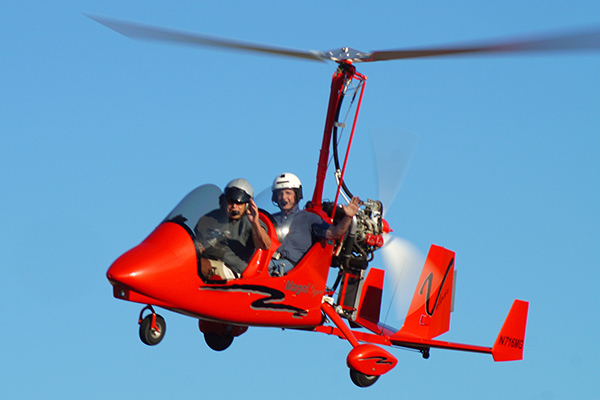 The M-22 Voyager is a new design gyroplane based on the popular M-16 Trainer model. The model sports large and stylish baggage strakes on each side of the tandem enclosure. Baggage space includes available space under both seats. The M-22, with its new rakish strakes presents a new and very attractive look to the already stylish line of Magni gyroplanes. The M-22 Voyager is the same performance and price as the dual control 914, M-16 Trainer. The M-22 is available only with the Rotax 914UL engine. All appropriate M-16 options are available on the M-22, such as the rear seat windscreen shown in the photo. The M-16 Trainer has always been a popular cross-country gyroplane. Around Europe and Africa, flights of M-16s regularly fly thousands of kilometer adventure tours. In the U.S., Magni Gyros have regularly made long trips – for several years now I have flown my M-16 Trainer from Missouri to PRA and EAA conventions in Indiana and Texas. Baggage storage for longer trips has always been a bit wanting. Now, the M22 provides approximately 150 liters (over 5 cubic feet) of available storage space. External compartment doors provide easy access.